Grandes lignes: Tells the parable in simple language; then gives the explanation of the meaning. Simple and straightforward. Jesus began to preach. Listen to what He told the people. One day a man went out to plant his garden. 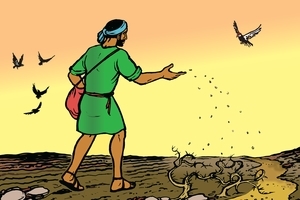 He scattered the seeds with his hands. Some seeds fell on the side of the path. The birds came and ate them. Some other seeds fell on stony ground only thinly covered with soil. These seeds grew quickly, but the roots could not go deep because of the stones. When the sun became hot, these plants dried up. The roots were not deep enough. Some other seeds fell among thorns and weeds. They grew up together. By and by the thorns became so thick that the plants could not grow any more. The plants never brought forth any good seeds. But some seeds fell into good ground. They grew well from the time they were small until they were big. Some plants brought forth 30 seeds; some had 60 seeds; some even had 100 seeds. Jesus said: "If you have ears, you ought to hear and understand this story!" Jesus' friends said, "What does this story mean?" Jesus said, "The seed is the words of God." They are the good news that God sends to all people. The ground is like the hearts of people who hear God's Word. Some people's hearts are hard like the ground on the side of the path. God's Word cannot penetrate them. For this reason Satan can steal the word away from them. Other people's hearts are like the stony ground. They are glad when they hear the story of God. They think that to be a Christian is easy. But when other people laugh at them or make trouble for them, they give up. Other people are like the ground where the thorns grew. They receive the Word of God, but they also love things of this life. They worry about many things instead of praying about them. They want to have a good time. At the finish they do not bear any seeds. But some people are like the good ground. These people hear God's Word and take it into their hearts. They obey it. Their lives show that they belong to God. They love Him with all their strength. They bear many seeds. Some of these good seeds are: Love, joy, peace, a quiet mind, kindness, goodness, promise keeping, gentle behavior, control over desires (Gal. 5:22) and telling others about Jesus. Will you say to Jesus these words? "Take my heart, Lord Jesus. I want it to be like the good ground. I want to bring forth much fruit. Amen." GRN has recorded a version of this script in 256 languages and dialects. See full list.